I just got back from a weekend in New York. I slept. I walked. I spent time with my closest friends. The city might be dirty, but I can breath so deeply there. My dear friend Miriam had me over to her swanky new place and fed me swanky food. This recipe uses a can of orange juice concentrate! Now that's the kind of simplicity I can get behind. So invite someone over. Pour some Malbec (better for conversation than for fish. oh well!) Citrus Halibut Halibut fillets 1 can of orange juice concentrate (thawed) 1 red onion Half a stick of butter Flat leaf Italian parsley 1 lemon Salt & pepper Wrap Halibut fillets in tin foil and bake at 350 for 30 minutes. Finely chop red onion. Melt butter in a pan and add onion. Salt and Pepper. Saute for 5 minutes Add orange juice concentrate and let thicken. 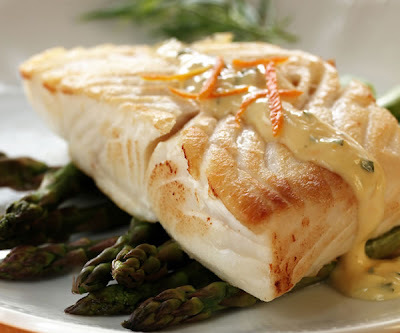 Remove Halibut and add drizzle orange juice sauce over fillets. Return to oven for 5 more minutes. Remove from oven. Sprinkle healthy serving of chopped parsley on top and squeeze lemon on top. Goes great with easy asparagus. Easy Asparagus Snap asparagus at the natural break. Place asparagus spears on a baking tray. Drizzle olive oil. Salt and pepper, and shake tray so all spears are coated. Bake in oven at 350 for about 15 minutes (or until tender).